In an effort to push the boundaries of experimental architecture, sustainability, and social responsibility, atelier V: architecture (www.atelierv.com) continually searches for solutions to the question of “Shelter” in a way that would affect large populations of people and provide an alternative to existing norms so readily practiced in recently developed cities of The Middle East and North Africa, thereby participation in eVolo 2013. ” The Courtyard Cube as we call it, is really a condensed self contained and for the most part a self sufficient mechanism to house thousands and ultimately millions of people in what would otherwise be inhospitable environments around the globe” Says Mark Vaghei, AIA, atelier V’s Principal in Charge. As the the world population increases and resources become more scarce by the day, solutions must be found to satisfy the demand for housing and work space with minimal carbon footprints and renewable sources of water and energy. 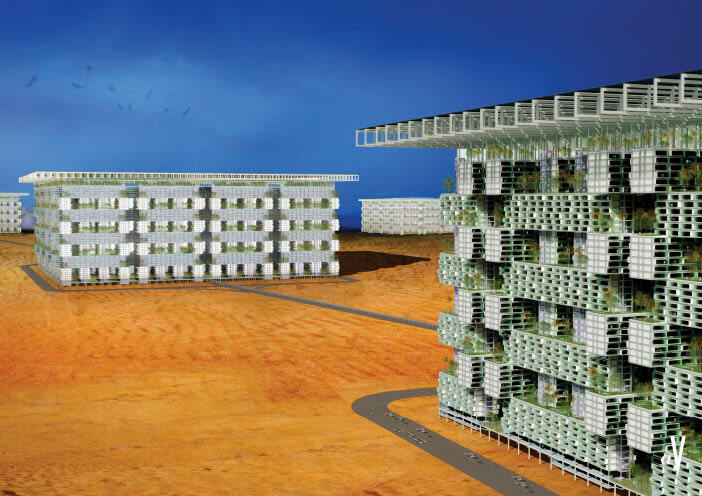 The Courtyard Cubes can ultimately become organisms that breath, regenerate and produce. They can become our cities of the future containing housing, agriculture, factories, work space, green space and recreation all plugged into a larger smart grid. Imagine the possibilities ! Parametricism, architecture of hollow unreality? Is it possible to be both builders of the prestige spaces of capital and self-declared avant-gardists? Owen Hatherley takes a look at the fluid architecture and financial times of Zaha Hadid Architects The New Avant-Garde Acknowledges its Precursors This summer, there was an exhibition at the Galerie Gmurzynska in Zurich entitled Zaha Hadid and Suprematism. It was a ‘dialogue’ between the Anglo-Iraqi architect, winner of the 2010 Stirling Prize – and her apparent forbears, the 1920s Soviet avant-garde, as her flowing, bristling forms whipped through rooms containing works by Kasimir Malevich, Alexander Rodchenko, Nikolai Suetin and El Lissitzky.